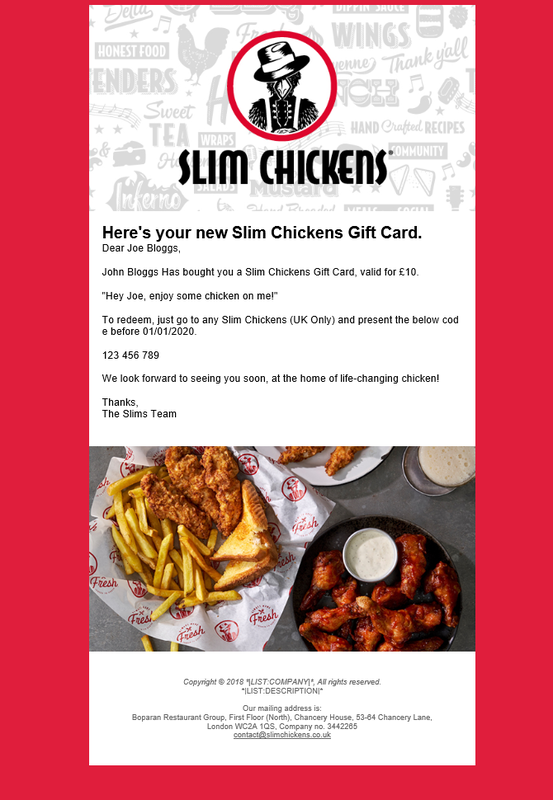 If you want to help share our life-changing chicken with the world and recruit more people to the 'Slims-Nation', why not get them a gift card? From £10-£150, you can send a gift code straight to your friends and family via email or SMS. Where can I buy Slim Chickens gift cards? Email our team at contact@slimchickens.co.uk with your details and we will respond to your query as soon as possible. Email our team at contact@slimchickens.co.uk, who should be able to help you with any further queries. Can I order large quantities of Slim Chickens gift cards? Certainly. Simply call the gift-card team on 020 3077 5880 - the line's open from 10am to 4pm Monday to Friday. Where can I find Slim Chicken's terms and conditions? Please enter the long number displayed on your gift.